Jeremy Grantham is a value investing legend. The founder of Boston-based investment giant GMO predicted both the dot-com bubble and the financial crisis of 2008. Today, Grantham is worried once again. With valuations sky-high, Grantham expects U.S. stocks to be a lousy place to make money in the coming decades. But Grantham does expect one resource to fare unusually well - timber. 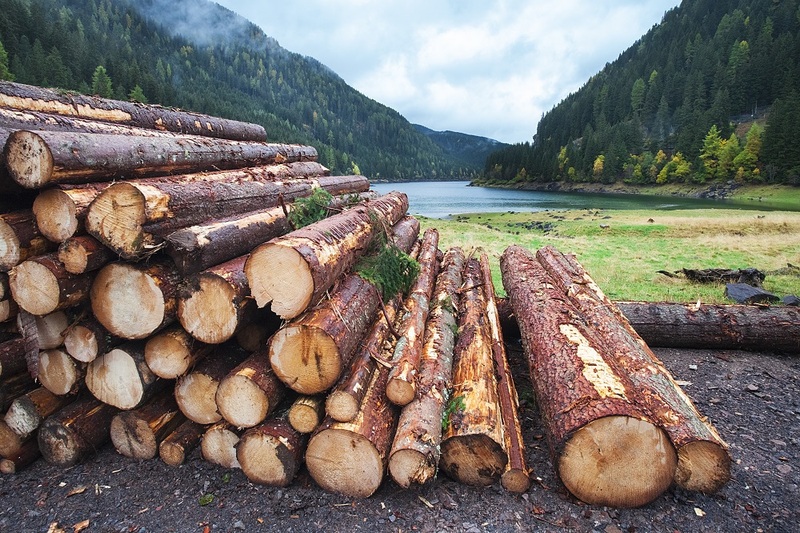 Grantham predicts timber will rise an average of 4.8% annually over the next seven years. Until you realize Grantham forecasts 4.6% annual losses for U.S. large cap stocks over the same period. Put another way, Grantham expects timber to outperform the overall U.S. stock market by an eye-popping 9.4% per year! No wonder Grantham has called timber the "perfect investment" for anyone with a time horizon of, say, 20 years or more. You've probably never thought of investing in timber. First, timber has some unusually attractive investment characteristics. Companies go out of business every day. Countries may even disappear off the map. But trees grew through two world wars, the Great Depression, the rise and fall of the Soviet Union, 9/11, and even Donald Trump's election. Trees will keep growing, no matter the latest financial or political shock. Second, unlike wheat or corn, trees don't need to be harvested every year. And delay harvests when prices are down. In other words, "banking timber on the stump" helps smooth out prices and ensures against crashes. Third, the global supply of timber - the rate of tree growth - is falling even as demand is exploding. The world has lost the equivalent of 1,000 football fields of forests per hour for the last 25 years. That's about 10% of the world's wilderness. Meanwhile, there's been a surge of demand for timber, primarily from China. Exploding demand combined with dropping supply virtually guarantees higher prices in the future. Historically, timber has been a terrific investment. It has outperformed the S&P 500 for more than 100 years. From 1971 to 2010, timber generated average annual returns of more than 14%. That's enough to have turned $10,000 into more than $1.6 million. Timber has also been a terrific investment during times of financial crisis. During the Great Depression, timber gained 233% even as the price of stocks fell more than 70%. In 2008, while the S&P 500 fell 38%, the value of timber rose 9.5%. Timber also performs exceptionally well during times of inflation. From 1973 to 1981 - when inflation averaged 9.2% - timber prices increased by an average of 22% per year. So if you're looking to protect yourself against a financial crash or inflation (or both), before you look toward gold, think about timber. While investing in timber is one way to insulate yourself from stock market fluctuations, it also has its hassles. First, forests aren't as liquid as stocks. You can't sell timber overnight to raise cash. Second, valuing assets that trade infrequently or aren't generating cash is as much art as it is science. You never really know how much your timber's worth until you try to sell it. That's why my favorite way to invest in timber is through the iShares Global Timber & Forestry ETF (Nasdaq: WOOD). The most significant chunk of this ETF - 35.5% - is invested in U.S. companies. Timber is, however, a global industry. So foreign stocks account for a much more significant portion of the Timber & Forestry ETF's portfolio than you may expect. Canada accounts for 17% of it. It also has significant allocations in Brazil (11%), Japan (10%) and Finland (8.8%). Technically, the ETF is also in a stable long-term uptrend and has doubled the returns of the S&P 500 over the past two years. So, yes, timber is an unusual resource you may have ignored. But the investment case for timber has rarely been stronger than it is today. 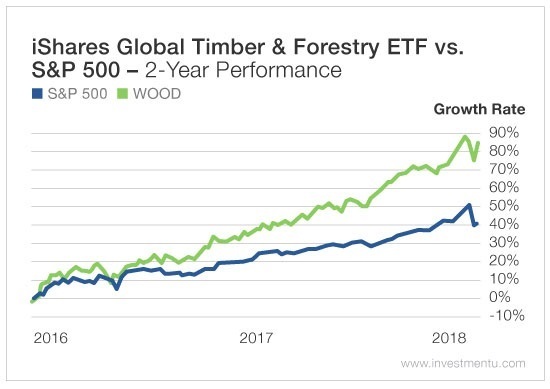 Perhaps like you, I was floored (hard, not carpeted) to learn that timber as an investable resource has outperformed the S&P 500 for more than 100 years. Amazingly, it seems to be both recession- and inflation-resistant. Who would have "trunk" it? Kadant (NYSE: KAI), a 2017 addition to Oxford Resource Explorer's portfolio, has gotten in on the lumber action. Last year, the company announced it acquired the forest products business of NII FPG Company for $173 million. In June, I wrote about how Kadant is benefiting from the demand for more boxes due to the e-commerce boom - as well as the need to recycle those boxes. NII FPG is the world's leading designer and manufacturer of equipment used by sawmills and veneer mills. It also makes harvesting equipment to cut, gather and remove timber from forest plantations. This makes NII FPG a good fit. In 2016, 9% of Kadant's revenue was from its wood processing segment. Recently, it has been an even stronger performer. With the NII FPG acquisition, Kadant added to that strength. On top of that, more than 50% of NII FPG's business comes from parts and consumables. This is right in Kadant's wheelhouse - the majority of Kadant's revenue comes from its parts and consumables segment. So this is a strategic acquisition that expands Kadant's portfolio and increases its aftermarket revenue. NII FPG's forest products business reported $81 million in revenue in 2016. That means Kadant could recover the acquisition costs in a little more than two years. But this approach isn't new for Kadant. The total spent on acquisitions from 2006 to 2016 was more than Kadant spent on share buybacks during the same span. To me, that's important. I'm not a fan of share buybacks. I understand the benefits of doing them. But I'd rather see capital be spent on acquiring growth instead of artificially simulating growth by reducing the number of shares - which inflates earnings per share. I think it's also key to point out that a big chunk (37%) of the money Kadant spent on share buybacks between 2006 and 2016 took place in 2008. Beyond being active, Kadant is seeing solid returns on these acquisitions. In 2016, Kadant recorded a 23% weighted return for the companies purchased between 2012 and 2015. Kadant's goal is $700 million to $800 million in annual revenue by 2021. In 2017, it reached $515 million, a 24% year-over-year increase. Acquisitions like NII FPG are helping Kadant achieve that long-term goal.